Reservoir Street Landfill? Who knew?? Who new!? I drive by this location several times a week, and never would have known! According to the March 29, 2008 issue of the Daily News Record, sometime between in the 1930-1960 vicinity, a landfill existed near the intersection of Reservoir Street and Myers Avenue. The precise location of the landfill isn't clear, but read the article for a bit more information about the location and history. 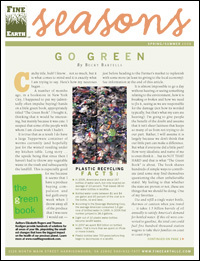 From my March article in the Shenandoah Valley Business Journal . . .
How Many Buyers Feel . . . Appreciation isn't what it used to be --- while real estate values are still increasing, they are not doing so at the tremendous rate that they did between 2002 and 2006. National news is depressing --- we are bombarded with messages of rising foreclosures, plummeting home prices, and a possible recession. Peer pressure is powerful --- as long as sales continue to be low, many buyers conclude that they too should wait to commit to a purchase. What Buyers Should Realize . . .
Housing selection is ideal --- with higher housing supply than we have seen in years, buyers have more choices than ever. Interest rates are historically low --- as rates rise in coming years, the monthly cost of housing will only rise. Prices here are stable and increasing --- we haven't followed the trend of many parts of the country where prices have plummeted. How Many Sellers Feel . . .
My house will never sell --- even with a decent number of purchases in a given month, there will still be lots of homes that haven't sold. I'll lose money if I sell now --- owners who need to sell a year or two after buying are feeling the pinch, as appreciation was lower last year. I'm helpless --- some homes are languishing on the market, and conventional marketing methods don't seem to be producing results. What Sellers Should Realize . . . It is not a great time to sell --- in almost all price ranges and locations, supply exceeds demand, leading to less negotiating power for sellers. Overpricing is fatal --- it is essential to start with a realistic asking price, or you will likely reduce the price well below that price to eventually sell. You won't always make money --- the years of being able to sell 12 months after having purchased and making money are over, at least for now. Some Conclusions . . .
Only buy if you plan to stay for a few years --- the transaction costs of buying and selling, and lower annual appreciation rates make it important to consider how long you will be in a home. When selling, have realistic expectations --- overpricing is more harmful now than it ever has been; you will likely net more as a seller if you embrace market realities from the start. Do your homework --- opportunities abound for buyers in our current market, and sellers can also do well; however, it is more important than ever (from either end of the transaction) to know the relevant segment of the real estate market inside and out. We constantly hear national statistics and and stories on the news about the national housing market. On this blog, I endeavor to provide helpful analysis of our local housing market --- since it often is characterized by very different trends than other parts of the country. But, at least for a day, I will be abandoning my local focus . . . Tomorrow, I will have the opportunity to learn firsthand about the national housing market, and where we may be headed. Along with four other Virginia Realtor bloogers, I will be having lunch with Dr. Lawrence Yun, the chief economist for the National Association of Realtors, who was recently named (by USA Today) as one of America's top 10 economists. 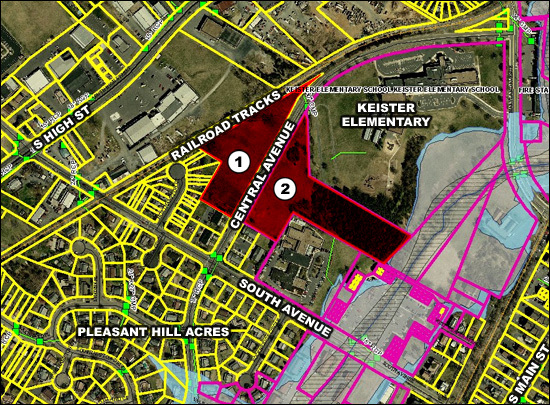 The City of Harrisonburg is accepting bids on the two parcels of R-2 land labeled below. The first parcel (labeled "1" below) contains 3.119 acres. The second parcel (labeled "2" below) contains 5.018 acres. This land, zoned R-2, provides for a great residential development opportunity --- a convenient location close to Route 11, Route 42, Port Republic Road, Keister Elementary, and more. Bids will be accepted until 9:00AM on April 8, 2008, and the bids will be opened at the City Council meeting at 7:00PM on April 8, 2008. This house is currently on the market --- click here for details. Do Buyer Incentives Encourage A Sale? Many sellers think so.....but I rarely meet buyers who think so. Sellers often hope to set their property apart from others by offering a buyer incentives to purchase their home. In theory, with two identical houses with identical asking prices, if you get a year of trash service with one, and not with the other, all buyers would pick the house with free trash service --- right? But wait --- all such logic goes out the window given the negotiation process! For instance, it is quite possible that when presented with an offer, the seller of the house without free trash service might come off of their price by $8,000, while the seller of the house with free trash service might not negotiate at all. As becomes clear --- the existence of a buyer incentive does not at all guarantee a better opportunity for the buyer --- and buyers know this! Additionally, buyers can ask for and attempt to negotiate any term they so desire in a contract. If you want free trash service from a seller who isn't offering it --- ask! If you want closing costs from a seller who isn't offering them --- ask! I rarely find a buyer who is bashful to include such concessions in an offer, even if it is not being advertised by the seller as being possible. Thus, the non-existence of a buyer incentive doesn't mean that the concession won't happen --- and buyers know this! A few final notes . . . If we're in a strong seller's market (which we're not as of 3/2008) where sellers can demand any asking price they desire, a buyer incentive can work --- it highlights flexibility in negotiations. I find it especially interesting when a seller advertises a buyer incentive, and then tacks on "with full price offer." If, given the choice of a year of POA dues (value roughly $480) with a full price offer, or negotiating $1,000 (or more) off the asking price --- I'd ignore the incentive and negotiate on price! Advice to buyers --- don't be distracted by incentives, other than to acknowledge the stated flexibility of a seller before negotiations even begin. Advice to sellers --- lower your asking price by the value of the incentive --- that is effectively what you have done anyhow (by revealing your flexibility to those who see that detail), but without the mass benefit of a lower asking price. Lastly --- I'd love to be proved wrong! 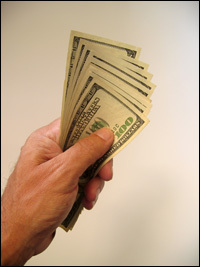 Are you a seller who has seen the value of offering a buyer incentive? Tell me about it! Are you a buyer who decided to buy a home because of a buyer incentive? Tell me about it! I am delighted to be a part of marketing and selling the Urban Exchange project --- an exciting new construction project in downtown Harrisonburg featuring retail space on the first floor and almost 200 apartments and condos. The photo below shows the excavation progress (these aren't just really deep footers, there will be two levels of underground covered parking). See more photos of the progress by clicking here. As a proud (two-time) JMU alumni, I'm excited to wish JMU a Happy 100th Birthday! More details on the festivities are here . . .
Click the image above for a printable version of this fantastic photo --- formed by several thousand members of the JMU community (students, faculty, staff, administration, etc). Evaluating Investment Properties . . .
Over the past few years, an increasing percentage of my buyer clients have been investors, who are purchasing income generating properties in Harrisonburg and Rockingham County. Most of those properties have been townhomes, with a few condos and a few single family homes mixed in. They have bought about an even mix of student housing and non-student housing. I love data analysis and statistics, and thus, it has been a fun and exciting part of my job to assist these investors in purchasing properties. Many of the investors that I have worked with have their own processes, techniques and spreadsheets for analyzing the value of an income generating investment property. They are looking at factors such as: depreciation, gross operating income, vacancy rates, annual operating expenses, cash flow, net operating income, return on investment, cap rates, etc. To better understand all of these concepts, and to better assist my buyer clients, I developed a spreadsheet (pictured below --- click on it for a more legible PDF version) to help analyze the value of an investment property. This analysis tool is helpful on a property-by-property basis, and also when comparing several investment opportunities side by side. If you want to know more about real estate investing, let's get together and I'll walk you through this spreadsheet to explain the different concepts. If you are considering purchasing an investment property, I would be happy to analyze the value of the investment to help you make a well informed buying decision. If you currently own investment property, this tool can also be helpful in comparing the value of a property that you currently own with a possible replacement property. Rent To Own --- Balancing the Risks and Benefits . . .
Housing supply in Harrisonburg and Rockingham County is high in many price ranges, and has been for many months now. As a result, some sellers are anxious to sell their homes, and some buyers are hesitant to commit to buying. It has become a standoff of sorts! Additionally, some buyers are having difficulty obtaining financing, as many loan programs have disappeared, or become more restrictive (100% financing, for example). Buyers are typically most excited about obtaining new housing without closing costs, a mortgage, or a long-term commitment. A buyer can, at some point in the future buy the home in which they have been living, without physically moving, and often at a sales price determined at the start of the rental relationship. Aside from the missed opportunity of tax savings, paying down mortgage principal, and appreciation --- a rent-to-own opportunity generally works well for a buyer. Sellers are often very lackluster about the opportunity to lease their property to a buyer and then (possibly) sell it to them at some point in the future, for good reason. Often, the future purchase price is fixed, which eliminates the seller benefit of increases in property values. A buyer typically is not required to buy the property, and thus the seller may be back in the same situation of needing to sell, when the buyer's lease term or option period comes to an end. They only positive aspect of a rent-to-own scenario for a seller is the fact that someone starts providing incremental income immediately. Cash flow can sometimes drive a seller to commit to a rent-to-own relationship. Is all, or part, of the rent credited to the buyer's future purchase? How long can the buyer rent before having to buy or vacate? Do both the buyer and the seller have the ability to decide that they don't want to buy/sell the property at the end of the lease period? Can the buyer end the lease period early and proceed with a purchase? Is the purchase price set at the beginning of the lease term, or at the end of the lease term? These are just a few of the many issues and questions to consider when pondering a rent to own relationship, either as a buyer or seller! Don't miss the Harrisonburg Planning Commission public hearing meeting on Wednesday, March 12 at 7:00 p.m. in the City Council Chambers at 409 South Main Street. As usual, it's not easy to tell what some of the proposals actually mean --- but I have included a summary and explanation of the ones that I can decipher, and I welcome anyone else's insight. Again, the information below is what I can piece together about the proposals from various sources. Attend the meeting to find out more about the proposals, or to voice your support or concerns. RMC Corporation would like a special use permit for a recreation facility to allow recreation and leisure time activities at 1000 South High Street in Harrisonburg. The photo to the file photo in the Harrisonburg Real Estate Information System. Heritage Estates is applying for a special use permit to allow a community building used for "recreational, social, educational and cultural activities." Perhaps they are building a community center?? Heritage Estates, pictured to the left, is located on Garbers Church Road. Heritage Estates is also asking for a proffer amendment --- but the details here are a bit vague. Muhlenberg Lutheran Church is requesting a rezoning of 1.63 acres (on East Market Street) from B-2 to B-1C. This would allow them to move forward with a $2.2 million addition of a "gathering area." The church had originally requested an exception to the B-2 zoning ordinance, but this was denied by the Harrisonburg Board of Zoning Appeals on February 4, 2008. Hugo A. Kohl, III would like to rezone a rather small (3,000 +/- square foot) lot at 311 South Federal Street from B-2 to B-1C. Anyone have information on this one? Campus View Condominiums is requesting a rezoning of around 14 acres from R-3 to R-5C. This change would allow for higher density development. Additionally, Campus View Condos is requesting a special use permit to allow for multi-family dwellings with more than 12 units per building. As you consider buying a newly constructed home, it is important to be aware of what is often referred to as a one-year builder warranty. Technically, what we are referring to are "Implied warranties on new homes" per Virginia statute 55-70.1. 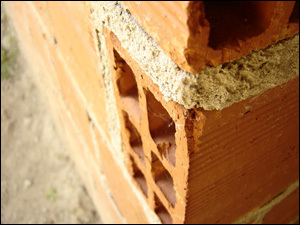 The builder warrants that the "dwelling with all its fixtures is, to the best of the actual knowledge of the vendor or his agents, sufficiently (i) free from structural defects, so as to pass without objection in the trade, and (ii) constructed in a workmanlike manner, so as to pass without objection in the trade." Essentially, no structural defects, and workmanlike construction. When does the one year start? The earlier of when the title is transferred, or when the buyer takes possession of the property. I bought a house three months ago and have discovered structural defects. The builder is telling me a warranty doesn't exist, because "as is" was written into the contract. Is this possible? It is possible to modify or exclude the Virginia statute based implied warranty. However --- it is likely that the builder did not follow the statute when selling the property to you as is. To sell a new property "as is" and exclude the implied home warranty, the fact that the house is being sold "as is" must be written on the face of the contract, in capital letters, in a font size at least two points larger than the other type in the contract. This doesn't happen too often. I have a structural issue, what do I do? The statute specifies that you have a cause of action against the builder, but that you must first notify the builder of the defect and allow them a reasonable period of time (no longer than six months) to cure the defect. The foundation is warrantied for five years (instead of just one) --- though if a foundation issue exists, it must be reported to the builder within two years of when it is discovered. The Virginia statute keeps referring to a "structural defect" --- what is that? Per the code, "a defect or defects that reduce the stability or safety of the structure below accepted standards or that restrict the normal use thereof." Yes, that is about as vague as you can get. My builder is asking me to sign a warranty document at closing --- why? And should I sign it? First, take time to read the document. In most cases, such a document includes verbiage that limits the (vague) rights you would have had under the broad Virginia statute. Builders ask buyers to sign these documents to narrow the scope of buyer's possible warranty requests --- and this desire often comes from past buyers who have been unreasonable in asking the builder to address cosmetic (or other non-structural) issues within the first year. If the document only includes language that restricts or eliminates your rights under the broad Virginia statute, kindly refuse to sign the document. Unless all parties agreed in the sales contract that a warranty document would be signed at closing, the builder can not require you to sign the document --- it is imposing a new contract term on the buyer, when that was not included in the original negotiations. One caveat --- sometimes the document serves both the builder and the buyer --- it can do so by specifically stating items that the builder will indeed repair that might otherwise be in a gray area given the vague nature of the Virginia statute.